1962 Mazda R-360 Coupe "De Luxe"
Having started as a cork factory, the first roadable products of the Toyo Kogyo group from Hiroshima in 1931 were motorbikes and three-wheeler vans. The first car prototype was developed in 1940, though it took another 20 years before mass production could start. Along with the entire Japanese car industry, the development of Mazda then took off at truly breathtaking speed. 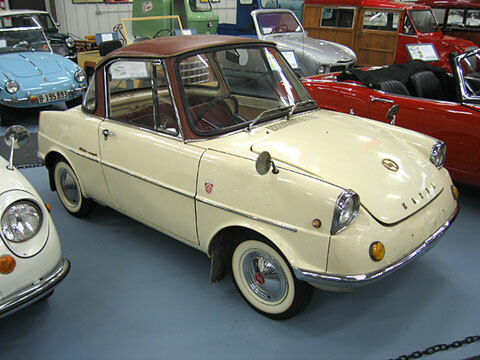 The first model in 1960 was the R-360 (the number indicates the capacity), a coupe that survived until 1970. In 1962, the slightly larger Carol (available with 360 and 600 cc) followed, a car that was similar to the Ford Anglia and had a reverse-angle rear window. In 1964 a convertible complemented the series. One of the reasons Mazda became known in Germany was because of its takeover of the Wankel rotary piston license in 1961 and is still faithfully using and developing this particular combustion engine technology today. Mazda collaborates extensively with Ford, is still making a Carol for the home market and has shown with its AZ-1 since 1992 that a coupe with folding doors does not have to be called "SL", that it does not have to come from Stuttgart and that it can still be beautiful, despite being 130 inches in length. As with other Japanese vehicles, small cars opened Mazda's door into a higher class market. Weight: 380 kg Electrics: 12 v 4 Wheels: 4.80 x 10"